AFF offers a complete gasket cutting, stripping, and fabrication facility. 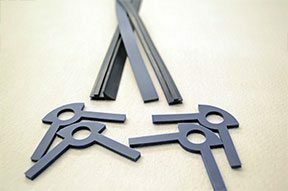 Gaskets are cut from a variety of rubber compounds. Our custom designed rubber gaskets are stamped out on with a press. AFF stocks a FDA approved metal detectable silicone that can be stamped out to any size/shape object. AFF stocks a FDA approved silicone that can be stamped out to any size/shape object. AFF stocks a FDA approved high-temp silicone that can be stamped out to any size/shape object. © 2019 American Fabric Filter Co. Web Design | Visual Realm.